Jason Anderson continued his consistent 2014 championship campaign with yet another solid podium ride. Unfortunately for the fans of NW Supercross, it also marked the last time the series will visit Washington. The team traveled to the NW with only Jason under the tent, dealing with a slew of injuries to all of it's 450 contenders this season. Cole Thompson being the most recent to go down with a knee injury one week ago. With the level of competition in the West Coast 250 class, it's very unlikely that any rider could win every race and take the title easily. The key to taking the #1 plate is to be near the front in every main and do the work necessary to do so during the week. 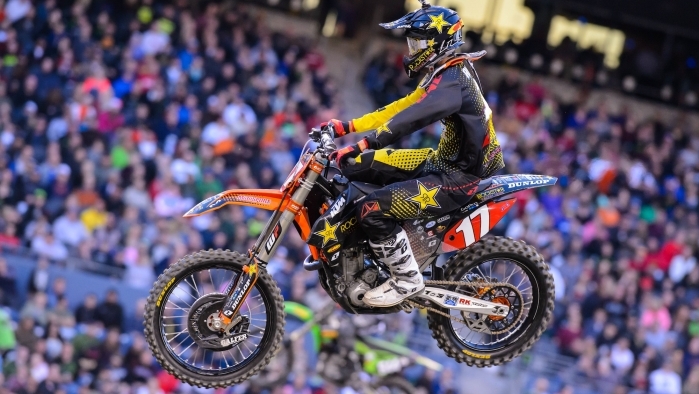 Anderson wasn't able to secure the victory in Seattle but it was certainly not for a lack of effort and he was rewarded with a 2nd place finish by race's end. Doing exactly what he had to and keeping the points lead. Once again he showed blazing speed in practice, posting lap times faster than any of the 450's. He had to come through the pack a bit in his heat race but still qualified easily with a good gate pick. As he rounded the first turn in the main event, he sat a ways back again, just inside the top 10. He had some work to do but there was no question that he would rapidly move to the front. It was pretty obvious that Jason was the fastest rider on the track throughout the entire main event. Unfortunately he also made a couple costly mistakes dashing his hopes to pick up a 5th win. He made his way past Justin Hill for 2nd and began reeling in Cole Seely. Then he washed out his front wheel in a berm and went down. JA quickly remounted and passed Hill for the second time shortly there after. He then followed that up by getting cross rutted on a triple and jumping completely off the track. He had to find a safe place to put his #17 back on the track and once again chase down Justin. He did just that, passing him for an incredible 3rd time. It definitely appeared that with the speed he was possessing, the victory should have been his, but that was not the case. He still accomplished what was needed however, picking up valuable points. Jason Anderson: "Seattle was a pretty good weekend. Coming out with the points lead. Going into the last race with a very good chance to win this championship. That's all I want!" The series will now head all the way back to the opposite end of the Country in New Jersey after a weekend off. The battle for the West Coast Championship will also be put on hold for two weeks before finally being settled in Las Vegas, NV. Anderson will not rest during this time as he focuses on winning his first ever professional Supercross title.